BUY JUVEDERM VOLUMA TO RESTORE VOLUME LOSS IN CHEEKS AND CHEEKBONES & TO LIFT AND DEFINE FACIAL CONTOURS. FDA APPROVED. WHAT YOU NEED TO KNOW ABOUT JUVEDERM VOLUMA (2 x 1 ml)? JUVEDERM VOLUMA is a reliable and one of the most famous members of the JUVEDERM family. It helps people look great, regardless of their age. It comes in the form of a gel (injectable implant) in pre-filled syringes. The product is completely ready for use (there are 2 syringes and 4 sterile needles in the box). The gel contains cross-linked sodium hyaluronate (Hyaluronic Acid 20 mg/mL), which adds volume to the sagging skin, and 0.3% Lidocaine HCL, which is a local anesthetic. JUVEDERM VOLUMA is not a universal dermal filler. It should not be introduced into the eyelids, under the eyes and in the lips. If you came here looking for dermal fillers for the lip augmentation (e.g.,UVEDERM ULTRA SMILE) at a low cost, read my reviews and check my store. You will immediately see the before and after results, if you choose having JUVEDERM VOLUMA injected. The filler improves the smoothness and volume of the skin on the cheeks, cheekbones, chin, jaw line and other problem areas. Not only does it replenish the lost skin volume, but is also used to improve the overall shape of your face, and Lidocaine HCL ensures a painless treatment process. JUVEDERM VOLUMA is one of the few injectable dermal fillers approved by the FDA. It is protected by 9 patents throughout the territory of the United States. The dermal the filler was developed using the super advanced VYCROSS technology – a combination of High Molecular Weight and Low Molecular Weight Hyaluronic Acid. Thanks to this technology, the gel turns out much smoother than similar products. To inject the filler, dermatologists have the opportunity to use needles of 2 different sizes, thus reducing discomfort and the risks of side effects. If you want to order JUVEDERM VOLUMA online at Anna’s Cosmetics, you will surely be happy with its attractive cost and a fast delivery. JUVEDERM VOLUMA gel is introduced using a syringe with a needle into the deep dermis. Before carrying out the treatment, you should wash the treatment area with soap and water. Your aesthetician will treat the desired skin area with alcohol or another antiseptic agent. 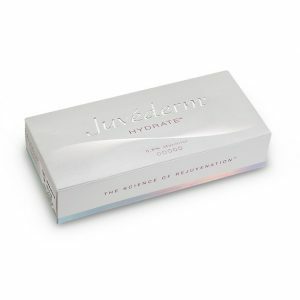 JUVEDERM VOLUMA is a viscoelastic, colorless and biodegradable gel. Therefore, it can be safely used to restore and/or increase the volume of the face. To ensure optimal use of the product, it is recommended to use the needles provided in the box. Volume & Packaging : Two pre-filled syringes of 1 ml gel. Accessory : For each syringe, its box contains two sterile 27G1/2” needles. Package insert. A set of labels in order to ensure traceability. Storage Conditions : Store at room temperature (up to 25ºC / 77ºF). DO NOT FREEZE. JUVEDERM VOLUMA dermal filler is manufactured in Europe by Allergan. Buy JUVEDERM available for sale on Anna’s Cosmetics to improve your looks and feel young and beautiful non-stop.